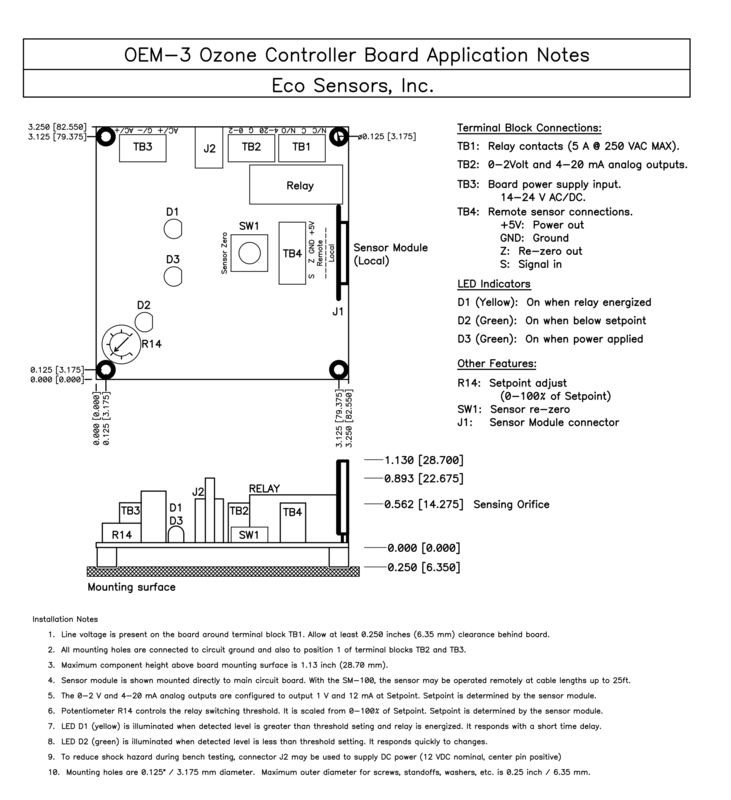 OEM-3 Ozone Controller is great for integrated solutions or use within your ozone generator. A simple and effective method to control ozone levels, or shut down equipment in the event of an ozone leak. 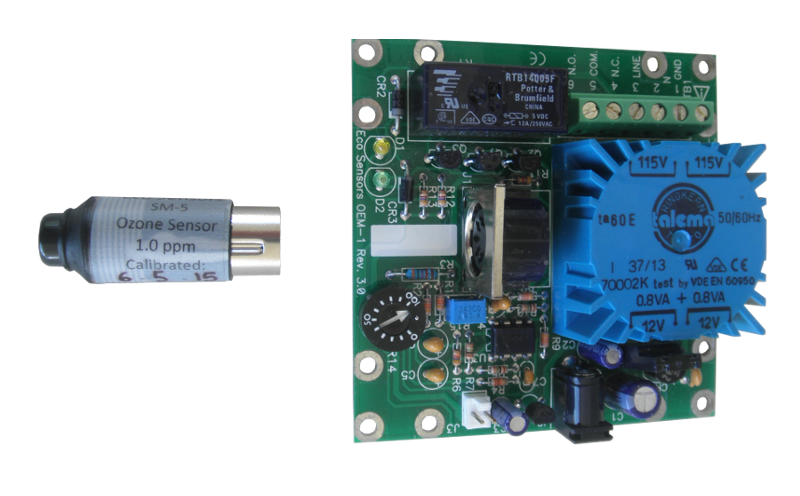 The OEM-3 is a 12/24 VDC powered board that offers a 4-20 mA output. For reference, the OEM-1 is a 120 VAC powered device that offers a 0-1 VDC output. For reference the OEM-2 is a 12/24 VDC powered device that offers a 4-20 mA output signal. The model OEM-3 is a system to control ozone generators and alarms based on an adjustable ozone concentration set point. It is designed to work with plug-in sensor modules for 0-0.1 ppm, 0-1.0 ppm, and 0-10.0 ppm. These are specified when ordering by putting the ppm range after the model number. For example, a 0.1 ppm OEM-3 board system would be OEM-3-.1 and the replacement sensor module for it would be OEM-O3-.1. The sensors modules can also be located at a distance from the OEM-3 boards by 6ft or 25ft (2 or 8 meter) cables. These are readily available DIN M/F 5 pin extension cables. One component of the OEM-3 system is the base board which incorporates the power supply, final signal processing, set-point controls, and the output relay. The other component is the sensor mounted with its associated electronics in a cylindrical DIN plug. This is pre-calibrated in our lab so that the sensor module and main board module together work as a calibrated system. If the sensor module is damaged, it is simply replaced by another precalibrated module. Sensor replacement on OEM-3 is simply plug-n-play. Remove the old SM-3 and replace with new.